The Planning Awards 2019 are now open for entries. Last year’s winners have described how winning an award boosted their profile within the sector. Previous entrants attested that even preparing an awards submission has helped team members take stock of their achievements. Attendees of last year’s awards ceremony also praised the opportunity it provided for networking - and for a great night out with colleagues. Run by Planning and Placemaking Resource, the awards reward excellence in professional planning work and related activities such as placemaking, urban design, economic development, housing and regeneration. Spanning 25 categories, the competition will recognise outstanding planning work by councils, consultants, developers, lawyers, voluntary groups and other key players in the UK planning system. Participants have until 7 February to submit their entries. Charitable organisations can enter at half-price rates. All entries must relate to work either carried out or completed since 1 October 2017. In evaluating all submissions, our expert judging panel will be looking for evidence that entries have improved or are likely to improve the physical or environmental quality of a place or the economic or social well-being of a community or other, category-specific, criteria. The awards will be presented at a prestigious central London ceremony and publicised in a special report in Planning and on PlanningResource and PlacemakingResource. Israel George, business development and marketing associate at BPTW, which won last year’s award for planning consultancy of the year, said: "The award is celebrated in our bid submissions, on our email footers and on business cards. 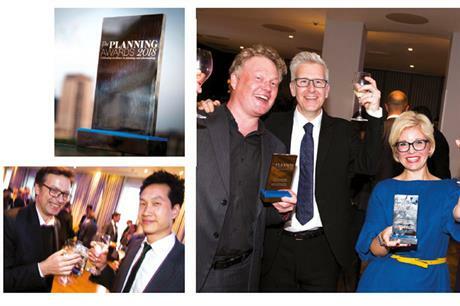 Photographs of the planning team with the award feature on our website, and our win has been featured in a number of trade magazines and literature. We are constantly being congratulated by our clients and consultants that we collaborate with. The award has certainly raised our profile." Rachael Scott, marketing and communications manager at Berkeley Homes, which won the 2018 award for community-led placemaking, said: "Winning such a prestigious award has been invaluable. Not only does it give the partnership a sense of achievement, it is also fantastic to be recognised for all of our hard work as a team. The evening was full of anticipation and excitement - and ended with a very well deserved celebration." Vin Onslow, account director at Oracle Group, which worked with Countryside to secure last year’s award for infrastructure planning, said: "Preparing for, attending and winning the award was a great team building experience and enabled the team to come together to celebrate success. The award helped to demonstrate the team’s capabilities both internally and externally and raise the profile of the development." Martha Lawson, project manager at the London Borough of Waltham Forest, which won last year’s award for best use of heritage in placemaking, said: "There have been many requests for site visits and learning days from external organisations." She also praised the awards ceremony itself. "It was a wonderful evening, great venue, food and refreshments," she said. "The host was very entertaining. It was good for networking." The deadline for entries is 7 February. Entry costs £245 plus VAT. For general enquires please email Tamsin Ballantyne on tamsin.ballantyne@haymarket.com or call 0208 267 4125. For sponsorship opportunities please contact Heather Lynn on heather.lynn@haymarket.com or call 020 8267 4785.